Generation Loss from hadto on Vimeo. So, how was this year's CeBIT computer fair? The media have been rather pessimistic beforehand. 25% less exhibitors, 20% less visitors, but despite the worlwide economic crisis you'll find confidence everywhere ... at least now. 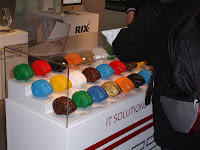 This year, I visited CeBIT only for a single day as exhibitor as well as a visitor. 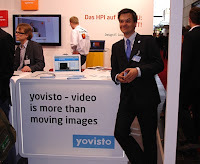 On friday, March 6th 2009, there was 'startup day' at the HPI booth in hall 9, B.10., and we presented our video search engine yovisto (well, it was almost only Jörg who did the presentation, while I was playing 'visitor'...). As every other year, for me hall 9, the 'future parc', is the most interesting hall of all 26 (!) halls. 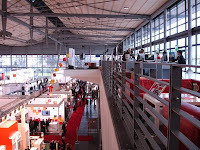 BTW, did you now that the Hannover fair area is the largest in the world? In hall 9 you could find the latest research of universities and research institutions (as well as some government and public administration...). But, on the other hand, I really liked the exhibition stands of the Fraunhofergesellschaft and the THESEUS research programme. Esp., at THESEUS (user scenario CONTENTUS) they demonstrated the workflow for digitalization, restauration, and indexing audiovisual media (...just my subject). While digitalization and restauration work pretty well, the indexing capabilities are still rather limited. You might search for 'similar' motives, but identifying individual persons is still subject to ongoing research. After all, I was really happy to stay just for one day. Some of our co-workers had to stay for the entire week (my sincere condolences!). Was it worth while? For one single day, of course yes it was!